Here are some great Bible questions when discussing grace. 1. Some say grace is amazing, why is that? Some give the definition of grace as an acronym; God’s Riches At Christ’s Expense, and that’s a very good definition but there’s more to grace than what Jesus did at Calvary. He willingly gave His life for those who were once enemies of God (Rom 5:10) who deserved only the wrath of God (Rom 2:4-6) and for those who reject Jesus as Savior, their only way to be saved (Acts 4:12), “There will be tribulation and distress for every human being who does evil, the Jew first and also the Greek” (Rom 2:9). When we see what we truly deserve but what we actually receive, grace is absolutely amazing. It’s not so much amazing that only a few will be saved but that anyone at all is saved. Jesus tells us to “Strive to enter through the narrow door. For many, I tell you, will seek to enter and will not be able” (Luke 13:24) because “Not everyone who says to me, ‘Lord, Lord,’ will enter the kingdom of heaven, but the one who does the will of my Father who is in heaven” (Matt 7:21). The fact is, “many will say to me, ‘Lord, Lord, did we not prophesy in your name, and cast out demons in your name, and do many mighty works in your name?’ And then will I declare to them, ‘I never knew you; depart from me, you workers of lawlessness’” (Matt 7:22-23). 2. What does the term “cheap grace” mean to you? To me, cheap grace is a grace that doesn’t effect change in a person and if we are not producing godly works, then we might wonder if we’ve really been saved because faith without any kind of good works is not really faith at all but a dead faith (James 2:19). Cheap grace is where someone professes to have faith in Christ but has no associated works proving that they are actually born again. A new creation in Christ will have a new mind (2nd Cor 5:17), new desires, and a heart bend toward obedience toward God. Since we’ve been saved by grace alone by faith in Christ alone, we should not have our faith be alone. That means we should be bearing fruit of righteousness such as “joy, peace, patience, kindness, goodness, faithfulness, gentleness, self-control” (Gal 5:22-23) but if the only fruits are “sexual immorality, impurity, sensuality, idolatry, sorcery, enmity, strife, jealousy, fits of anger, rivalries, dissensions, divisions, envy, drunkenness, orgies, and things like these” then Paul says, “I warn you, as I warned you before, that those who do such things will not inherit the kingdom of God” (Gal 5:19-21). 3. When we are saved by grace alone, does this grace comes alone? When a person is truly born again, they will have a new heart from God that will yearn to live a life that is pleasing to God and this means that we will walk in the good works that God has already prepared for us to walk in, long, long ago (Eph 2:10). Of course, these works don’t save us but we do these works because we are saved. Before this, we were only concerned about ourselves and we were the center of our own universe. The Spirit of God should make us “keep in step with the Spirit” (Gal 5:25) and not walk in the lusts and pulls of the flesh. Paul still struggled, even after conversion, as he wrote, “I do not do the good I want, but the evil I do not want is what I keep on doing” (Rom 7:19) but the good news is that he knew that what he was doing was not good. Before, our only desires were like in the days of Noah when “The LORD saw that the wickedness of man was great in the earth, and that every intention of the thoughts of his heart was only evil continually” (Gen 6:5). We still do evil but not every thought and imagination of ours is bent toward sin and pleasing ourselves. Now we seek to serve God and be the hands, feet, eyes, and heart of Jesus’ own body (Matt 25) to do for others as Jesus sees as doing for Him (Matt 25:40). On the day of His return, He will say “Truly, I say to you, as you did it to one of the least of these my brothers, you did it to me” (Matt 25:40). 4. 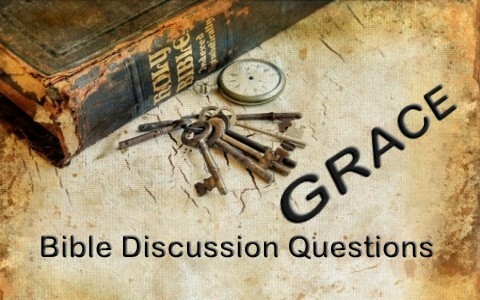 How can grace be summarized? The Grace of God is God’s unmerited favor upon sinners who turn to Him and put their trust in Christ. We weren’t saved because of who we were but because of Who Jesus is and what He has done for us (John 3:16). God’s grace is what He gives us which we do not deserve and mercy is what we do not receive which we did deserve (namely, God’s wrath). Grace cannot be earned and it is not deserved. None of us are good. It is only God Who is good to evil, wicked sinners and that’s why it’s so amazing. When we are saved someday, they will not say, “Wow, look at the redeemed” but they will say “Look at their Redeemer” meaning that He receives all the glory for our salvation. The only thing we contributed was a life full of sin that had to be removed by the precious blood of the Lamb of God. It is only “by grace you have been saved through faith. And this is not your own doing; it is the gift of God, not a result of works, so that no one may boast” (Eph 2:8-9) so Paul reminds us to stay humble because “What do you have that you did not receive? And if you did receive it, why do you boast as though you did not” (1st Cor 4:7)? Grace is more than amazing…it is beyond human comprehension, but thankfully, we don’t have to know everything…just one thing, and that is Jesus Christ and Him crucified for us. Consider that at one time, “And you were dead in the trespasses and sins in which you once walked, following the course of this world, following the prince of the power of the air, the spirit that is now at work in the sons of disobedience” (Eph 2:1-2). Paul knew a lot more than we do but he “decided to know nothing among you except Jesus Christ and him crucified” (1st Cor 2:2) and that’s enough for me. It is only because of “God, being rich in mercy, because of the great love with which he loved us, even when we were dead in our trespasses, made us alive together with Christ—by grace you have been saved—and raised us up with him and seated us with him in the heavenly places in Christ Jesus, so that in the coming ages he might show the immeasurable riches of his grace in kindness toward us in Christ Jesus” (Eph 2:4-7). In this way, God receives all the glory for we have absolutely nothing to brag about, because what do we have that we did not first receive from God? Read more about grace here: What Does it Mean to be Saved by Grace? Previous post: Should The Bible Be Read In Order?